Listen to my podcast to hear all about it. This book is our story, a story of love, loneliness, and faithful friendship. At it’s heart, it is simply the story of the friendship between me, my sister, and my mom, and the ways that shaped who we are as people and how we live. It is about how the throng of women I was surrounded by growing up shaped my image of what kind of woman I could become. It is about the friendships in our lives that have kept us strong and been great sources of delight. It’s our attempt to honor the beauty, satisfaction, and profound of friendship. You may be wondering: why tell this story now? Because we believe Women’s Friendships have been triviliazed and overlooked, which has impoverished our lives as women. Women’s friendship is not a light, fluffy thing of no consequence, but a powerful force for good in the world. Throughout all cultures and centuries, women have kept the world spinning through their fellowship. We feel that the vision has been lost, and that because of it, many women feel lonely, wounded, and unsatisfied. We want to recapture, and recast a vision of the importances of women’s friendships. Because we feel like loneliness and isolation have spread their icy fingers across the globe, beating down people’s morale and causing their love to grow cold. We’ve watched that loneliness spread, but we’ve also experienced it ourselves. Some have called it a loneliness epidemic. For the past several years, social scientists and psychologists have scratched their heads and wrung their hands regarding an overwhelming trend of loneliness in the West. Over the last fifty years, reports of loneliness have doubled. In a recent study based on a survey of 20,000 people, 47% said they always felt alone or lonely, 43% said they had no meaningful relationships and that they felt isolated from others. This trend toward isolation, loneliness, and friendlessness shows no partiality toward gender, age, race, or job.. We think this is having real consequences, and we need to be brave and clever as we respond to it. Because we firmly believe that we cannot be the women God calls us to be on our own. We need people in our lives that support us and call us into growth in every area of our lives—intellectual, spiritual, emotional. We need friendships that not only satisfy our hearts, but challenge our spirits. We need friends to agitate and encourage us into growth. The data seems to be screaming one painful truth: everybody is lonelier than they used to be. We want to fight that narrative. We want to be agents of friendship in a lonely world. And we want you to do it with us! Buy the book (and guidebook)! We want the book to get into as many hands as possible. And we hope that its message will spur people one toward starting their own Girls’ Clubs! 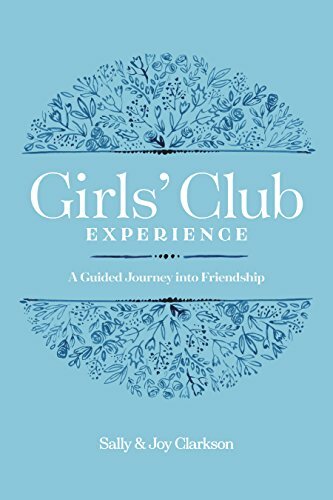 In pursuit of the latter, I would recommend buying the Girls’ Club Experience, which we wrote specifically to be used in the context of a one on one or group context, to help people know each other more deeply and learn to support each other. I’m not usually a guidebook girl, but I really think this offers something unique, and builds on the book well. I’m almost as proud of it as the main book! If you’re passionate about seeing women flourish in community, help us get the word out by joining our launch team. This is a private facebook group where you’ll get frequent updates on the books, challenges, and ways you can share about the message. People get really involved, and you never know: you may just make a friend! 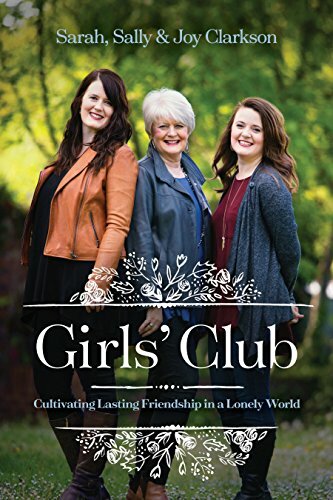 The other fun thing about the launch team is that you can be entered to win special Girls’ Club related prizes! 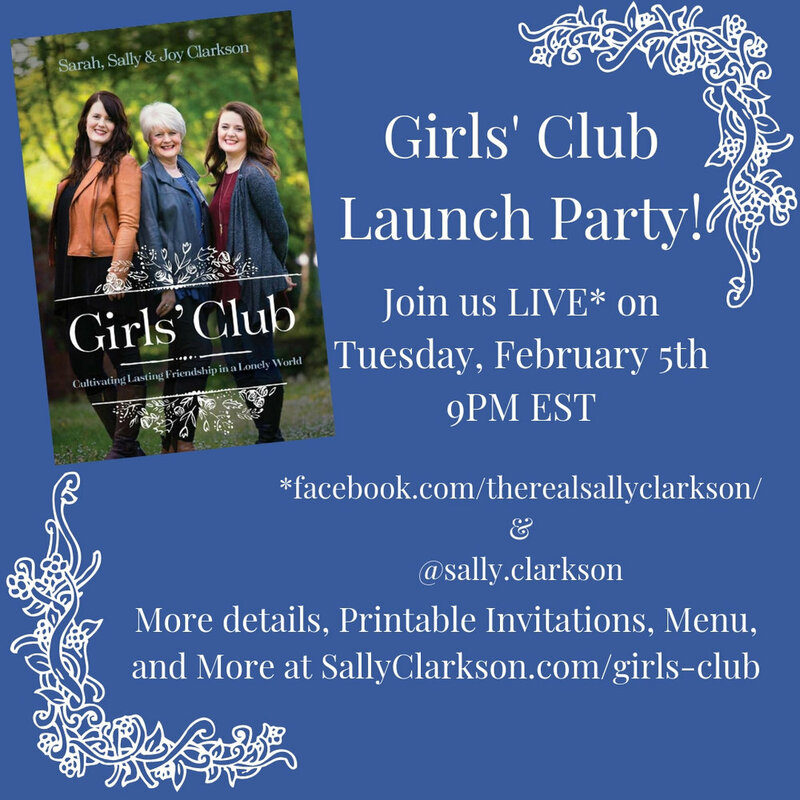 Join the Girls' Club Launch Team!! We interviewed women we admire about how to find, cultivate, and maintain friendships in a lonely world. For the last three weeks, my mom and I have been hard at work recording over TWO DOZEN (ahhhhh) podcasts on friendship. We wanted to launch the book by discussing this important topic with women we admired. We’ll be posting some of them on my podcast, and most of them on my mom’s. Katelynn Beaty: a writer and the (former) first female and youngest managing editor at Christianity Today. We talked about the things that make us lonely and the spiritual importance of friendship, and how it was the main relationship Jesus enjoyed on earth. We also talked about how to make room for each other’s callings in our friendships. Karen Swallow Prior: Author and professor. We talked about what it looks like to cultivate friendship in hard times. Karen is an expert on this topic because she literally got hit by a bus this year. Crazy story! Elena Trueba: a Harvard graduate student and my best friend/college roommate. We’ll be doing an advice podcast, so make sure to send us all of your juiciest questions! We’re also happy to help you discover what books and TV shows will light up your life. Ashlee Cowles: a novelist and dear friend. Ashlee and I talked about how personality plays into our friendships— for good and ill! And we talked about how friends can help us grow and smooth out the rough edges of our personality. It was such a joyful, fun podcast to record… and so important! Boze Herrington: Boze runs the delightful Twitter account The Library Haunter. Boze and I bonded over a shared love of literature, so we’re going to discuss special literary friendships throughout history. Boze isn’t a girl, but he’s so lovely that he can be a special, honorary member of Girls’ Club. I’m so excited to share these podcasts with you! Just seeing them all laid out here gives me a little thrill. I hope you love them as much as I loved recording them. To keep up with the podcasts, make sure to subscribe on iTunes (or Stitcher… wherever you listen!). 4. Join us for the Launch Party on February 5th! Whew! That’s all for now, friends! Don’t forget to listen into this week’s podcast (below). Wishing you rest, love, and beauty!